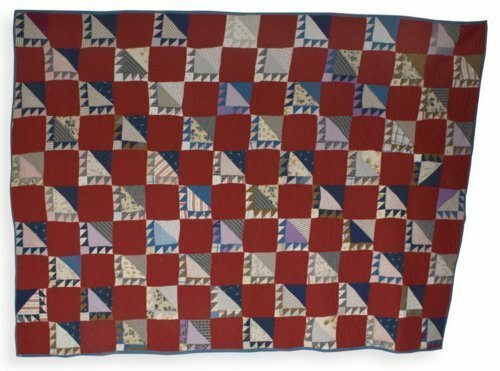 Red and blue cotton quilt made in Bear's Paw pattern. The maker was Mary Alice Koger Nye and the quilt was used in her family's household in Belle Plaine, Kansas. Fabrics in the pieced blocks came from dresses worn by Nye and her daughters before World War I, while fabric for the plain red blocks and blue/white pinstriped backing were purchased after the war. Batting appears to be a thin cotton sheet or blanket. Blocks are hand-pieced, and top was assembled by machine. Hand-quilted in diagonal lines.